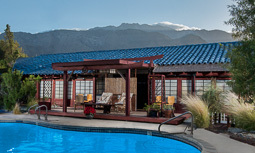 Sakura*, The Japanese-style Bed & Breakfast Inn is located near downtown Palm Springs, minutes from the airport, bus station or tram. The hosts offer Japanese-style rooms with a private bath, TV, handmade futons to give you the most wonderful sleep of your life, and sliding shoji doors that lead to the garden and swimming pool area that offer a magnificent mountain view. The atmosphere at the Inn is very distinct, quiet and relaxing. Guests can wear Japanese kimonos and slippers. Beautiful Japanese artwork and antique kimonos decorate the wall space. Delicate musical sounds of the koto and bamboo wood flute can be faintly heard throughout the Inn. Shaitsu, a centuries old Japanese acupressure massage, is available for your relaxation. Palm Springs is a famous desert getaway spot and there are over 100 golf courses in the area as well as tennis courts, hiking, biking and plenty of fine shops and restaurants, and other sight-seeing attractions close by to the Inn. Winter time day temperatures are between 70˚ and 85˚. * “Sakura” means “cherry blossom” in Japanese. Leave your shoes at the door and relax with the rising sun. In your kimono, sipping Saki, listen to the wind blowing from Mt. Fuji in the evening….